a security deposit depending on nos. of group will be required on arrival. 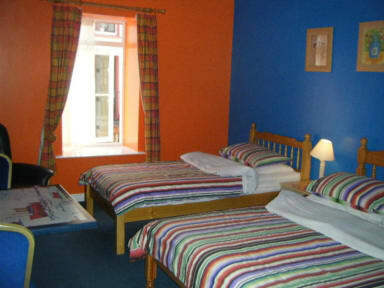 All our rooms are ensuite, some with bath and shower and are spacious, colourful and very comfortably furnished. Linen and towels are supplied. The reception area with adjoining patio is a great meeting place for guests. There is also a large common room with t.v. and games, dining room and large well equipped kitchen. Coin operated guest laundry. 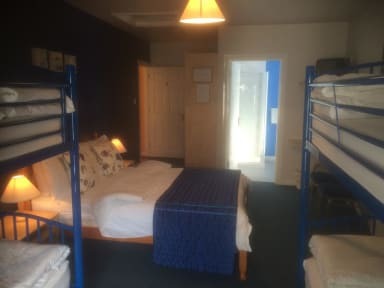 The hostel has disabled access and rooms with disabled facilities. We have a growing no. of very satisfied repeat guests whose key words description always include 'clean 'and 'friendly'. For a nominal charge guests can use the swimming pool and leisure facilities of the nearby Bayview Hotel. Killybegs has a beautiful natural harbour and plans for a marina development for 2007. The lights of the fishing vessels and the town make this a very impressive walk in the evening. The town has some excellent pubs with music and colourful characters. There is a good choice of restaurants in the town and surrounding area to suit all budgets.